What if Van Gogh had some people during his life time that believed in his works? What if Van Gogh had a constant companion who possessed inner strength that Gogh himself clearly lacked? Would he have ended his life the way he did? Did madness rule his life? And why are we(or I, at least) so drawn to his suffering, loneliness, madness, darkness, and obsessiveness? I was deep into those thoughts for the last few days. It’s a deep dark pool that I get sucked into every once in a while. Van Gogh calls my soul in a very enigmatic way. His life is so elusive, his path so solitary, his heart so turbulent. Inside the heart of an artist is full of fear. Anxiety is his constant companion, and impulsivity is his playmate. But most times he is so self-obsorbed that even the anxiety and impulsivity cannot stop him from going his solitary ways. He dwells alone within his inner world, sometimes walking or running right into the wild fire of thoughts, or crossing the deep river of flowing imaginations, or drowning. Inside the heart of an artist is also full of contradictions. He longs to to recognized, but at the same time, longs to be nobody. He wants the attention but at the same time, detests attachments. He hates being controlled, but at the same time, needs to have control. Most of all, he needs the control over his right to express. Inside the heart of an artist is also a lot of desires. But the deepest of all is the desire to communicate. He communicates to be understood. Deep inside the desire of wanting to be understood lies the desire for love. The artist wants to love and be loved. He writes poems like some people cry. He paints like some people pray. He dances like some people laugh. He sings like some people remember. He is lost when no words come. He is lost when his brush strokes feel wrong. He is lost when his body can’t ride the rhythm. He is lost when his voice goes off the tune. He is insecure and easy to be shattered. Did any one truly know these sides of him? His faithful brother Theo supported him better than any siblings could manage. But Van Gogh had bigger ambition. He wanted to reach out to a more broader population than his biological brother. He certainly has now, more than most artists in the history. But his life on earth ended as an inmate of a mental institution and he died a solitary death in a field not far from the asylum. He shot himself, or maybe he was shot as some speculate. 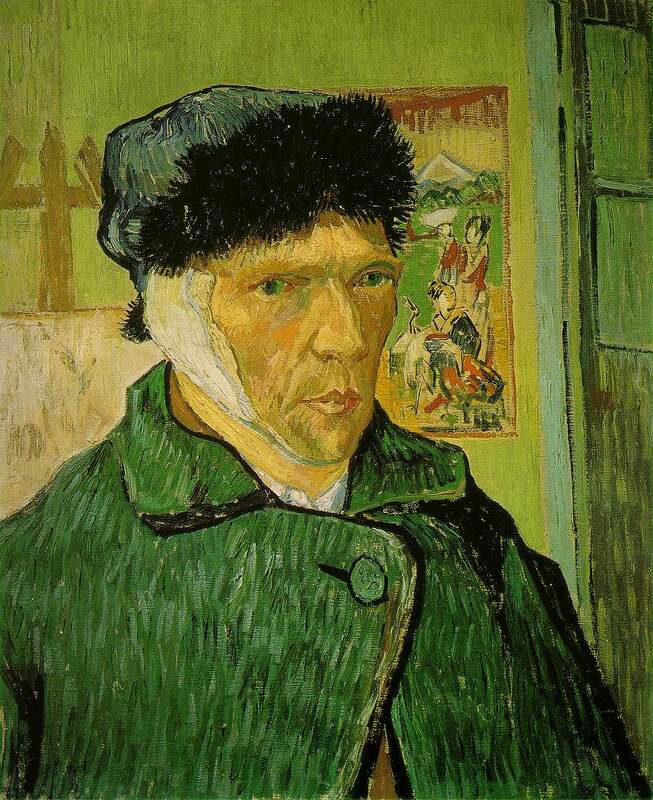 I’m far from the genius Van Gogh, but I have a deep desire to prevent another Van Gogh from living his whole life in tragedy. I believe a major source of their madness and mental sufferings comes from their burden of living a life of an artist. The gulf between their highest ideal and their reality is so wide that it is enough to engulf the big portion of the artist population. I am obsessed with my grandiose ideas and it’s not about some groundbreaking book idea. It’s about an art gallery/coffee bar business. It’s something I do typically when I lose sense of the reality, and feel like I can accomplish anything. I feel so powerful, invincible, and hopeful. There is a strong current of adrenaline rushing through my veins, and it makes me feel so high, like I am on some drugs even though I am not. So in this state, I am playing with my yet another business idea. I could focus on Van Gogh theme as my inspiration for being a guardian of the artists. It could be a place to trade local art works, and I could help local artists sell their art works at my shop so that they can profit without feeling like they are selling their souls! I know how they fear showcasing their own works. That’s exactly why I am operating anonymously here on lilyboat. So to explore this abstract idea of mine more, I even went to look at a space out for lease. It’s in the countryside, but only 20 minutes from this city. It’s a two story building that used to be a historic house, and what’s incredible is that it is a yellow house. The yellow house like the one where Van Gogh and Gauguin lived together to share their dreams and ended up living the turbulent weeks in Arles! Even the landlord who runs a practice with her oral surgeon husband in the building next door loves my idea. She used to be a jazz dancer, she said, and I immediately sensed that she knew about this side of life where I belong. I have met another idealist. Now I was on the intense search for local artists. I already had one who is interested; a senior art student that I know from the coffee shop I work at. We share the same bipolar trait, although, I have never directly asked her about it. You just know when you see one. I also emailed another artist I have found by googling, who was very attracted to my idea, except that she lived in a completely different state over 1000 miles from me according to her reply. She lives in a city by same name but in a different state. What makes this project even more challenging is that the property uses water from the well. I think it will be quite unique, but there will be a limit to the amount of coffee or tea I can sell in a day. I would hate to use all the water in the well and make my neighbor surgeon stop his surgical process because he has no more water in the middle of his very important work. The landlord told me as I was leaving. She probably doesn’t know that I can afford very little. Last night, I was in bed wide awake at 10 at night, reflecting on my behaviors especially for the past three days. What has gotten into me? I rise and fall, riding the rhythm of my thoughts, ideas and hormones. I entertain and impress myself, planning all these unrealistic goals. I always have these business ideas, and it’s not so bad that I am having these ideas. What’s bad is that it is so hard to keep myself from acting on my ideas impulsively. It’s how I’ve directed my life. But I know better now. Suddenly a song started playing in my head. It went, Ooh child, things are gonna get easier. So I looked it up on Youtube and played. It had a profound effect in calming me down. Then I reached for my iphone and opened the bible application. I decide to start a new reading plan on the topic of “Decision”. I was not surprised to find the first reading from Proverbs 3:5-7. I was especially impressed with the “Don’t be impressed with your own wisdom.” part. It was a direct hit. The struggle with my high energy for the past week seemed to weaken, finally. I have not slept more than a few hours for the last few days. Out of desperation, I took sleep aids to end my agony the night before. By the time the clock hit 11, I was slowly drifting off to sleep, with the song ‘Ooh child(things are gonna get easier)’ playing in my ear, and the rosary in my hand. It was another week governed by my energy and passion, but with the help of my sister acting as my own Theo, I was safely landing to find my ground again. My last thought for the night was about how short my latest mental flight was. Before, my hypo stage had lasted so long, even months. Of course, the terms for my depressive episodes were even longer, for years at times. The voices kept singing, ooh child, things are gonna get easier over and over. Things were getting easier. That, I knew for certain. And I had no doubt that things will get easier and easier by the healing of Jesus. Wow nice post. As an artist going through hell in my life right now I recently watched Van Gogh’s story. I was horrified to know he only sold one piece and killed himself at 37. Im 37 now and my wife just left (homeless) me because I don’t make enough money. So the depression and feelings of fear, pain and what have you started to consume me. But things are going to get easier and have started to. So I realize that giving up my art is not an option. Not giving in to the depression and pressures of what others expect of me. I sense so much strength in your comment! You are not alone in your struggle. Have faith and know that God cares for you! There is reason for every suffering. It will all make sense one day.. even though it is hard to understand. If it is easy to understand, then, it won’t be about faith, and faith is too beautiful to miss..
What’s sad about Vincent Van Gogh is that his parents did not understand him and almost accused him for the disgrace he caused to the family. It wasn’t the best environment for him, I guess. If he knew how much he would inspire for generations to come.. I keep you in my prayers. Keep it up!